Я публикуюсь со студенческих лет. Выпущено мной семь книг. В основном работаю в прозе жанра. Так же являюсь автором двух романов. Детская тематика мне очень близка, две книги: «Самая вкусная книга» и «Доброе утро!» посвятила детям. Активно сотрудничаю с разными журналами. Мой первый рассказ «Фронтовой хлеб отца», посвященный детям войны, публиковался еще в студенческие годы. За этот рассказ я стала лауреатом журнала «Агидель». Первый успех меня очень вдохновила, и с тех пор пишу. На сегодняшний день я автор семи книг. За книгу по одноименному рассказу получила государственную молодежную премию имени Ш.Бабича у себя в республике Башкортостан. Люблю путешествовать, изучать разные культуры. Это очень здорово! Gulnisa is gloriously happy when her father comes home from work earlier.Samerkhanagay returns before she goes to bed and buries himself into paperwork.He writes and composes something, counts without looking up.Child missing her father doesn’t let him out of her sight. Gulnisa is already in the first grade, but Samerkhanagay still treats his only kid as a baby.He indulges her and carries in his arms.But such moments are becoming less, because the work is increasing.There has been a war for two years.In two years the war has taken away husbands, fathers, brothers and sons.No matter how many claims Samerkhanagay has sent to join the war at his own will, he gets a postponement and stays in the village.«First of all, you are experienced manager», — they said. Over time such men had been mobilized too.But Samerkhanagay was needed at home front as forestry specialist. The 1943 brought changes into thelife of this family. In the 1943 forty-three years old Samerkhan got mobilization notice.And now in order to finish all papers he writes reports day and night.Gulnisa is glad that dad stays home for all the time.She knows that her father loves her and won’t scold whatever she did.And now she is sitting next to busy father again. Soon she climbs to his back and rumples his hair. «Hupp, courser! Let’s get me on the top of Kaf mountain!», – she screams.There are beautiful Kafmountains in the tails her father told. But, they say, not everyone can get there. «I will take you, my dear. As soon as I return, we will fly there. You will be grown up for that moment. Just wait for me» – says father and sits down for the reports again.MeantimeYamilaapay, Gulnisa’s mother, came in. – No, she doesn’t disturb me at all, – says Samerhanagay, caressing Gulnisa and returns to his work. – You’re spoiling her too much, daddy,– said Yamilaapay. Gulnisa, without any doubts, is spoiled and beloved child. Her brothers and sisters died of disease before they reached the age of one. OnlyGulnisa, the youngest kid, was born a healthy girl. Samarkhanagay, handyman and loving father, made several sledges, skis and skates for her. He wanted to raise an athletic daughter, and often compete with her.This «tender» girl has never lost in competitions between older children. – We will overcome all difficulties. Still, there are relations, we will stick together, – answered Yamilaapay trying to hold back her tears. AfterSamerkhanagai’s leaving, village seemed to become empty.Yamilaapayworked round the clock. Home was quiet. Gulnisa feltto be older. There was a joyful news that the German fascists were retreating.This news gave strengths and hope to the poor and hungry people. The day letter from front come is the biggest, the greatest high day.One day Samerkhanagay wrote that he had got hurt but returned to the battlefield. After month he carried a serious wound and was got to hospital of the city N.“This time I was seriously injured. They said I can not fight anymore. Soon I’ll come back home. Gulnisa, my dear, please dry berries by the time I got home. I missed strawberries from Our field very much”, – wrote he in next letter.Meanwhile, there were bloody and cruel battles near the city of N. Nobody in the home front knew about it. – Hurray! My daddy’s coming back!Mom, I’ll collect so many berries for my dad. Oh, how dad will be pleased! Mommy, maybe I’ll go now? We will start to dry them. What ifdad’s back tomorrow? After all, letters take so long to get here! – said girl, hastily grabbing a basket for berries. Gulnisa couldn’t sleep all night.It seemed fatherwould knockthe door and enter the house. So several times she went up and tiptoed to the door. She wanted to be the first who bring mother joyful message. Yamilawaked daughter up early in the morning.Girl didn’t get enough sleep and barely opened her eyes. It was the middle of the summer season, the most working time.All the people mow the hay for the collective farm.Nobody shirks work.Children are made to weed beet.And picking berries is not allowed – you shouldn’t trample haymaking.That’s why the girls went to the field without permission staying out of sight of everyone. If the collective farmchairmanKhalfetdinagaycatch them, it will not end well. The field was full of berries. Gulnisa’sface kind of lighted up. She would tell father about it without fail. Girls, laughing and talking, began picking berries. Girls ran away without looking back. Gulnisa ​​returned home with nothing.“Mom willcome soon. What should I say? Whatif father returns? Iwould not be able to please him”. The girl cried quietly. After a while the door opened with a creak. Mom entered and looked at Gulnisa with a smile. — Well, daughter, did you pick berries? — Why are you crying? What’s wrong, dear? But the girl did not have time to answer, as other man’s steps were heard on the porch. Seeing the strict chairman, Gulnisahid in a corner. –Yamilaapay, why did not your daughter go to weed the beets with the rest of the children? Who allowed her to pick berries in the wrong place? –Khalfetdin, your sisterSamerkhan returns, his letter has came… He got a heavy wound and askedGulnisa to pick berriesfor his arrival, – confusedYamilareferred to the chairman with mistake. “Sister”.But Khalfetdin paid no attention to it, the news were more important. After all, he wasSamerkhanagay’s student in the school, and before the war he worked under his leadership. Because Khalfetdin was one-handed, he was not mobilized. His voice became softer. –You said he is coming back? And he is badly hurt. – No, and I do not believe in fairy tales! At school the teacher forbids believing all fiction. My dad’s coming home! I start thinking about him — and there is no fatigue. As if my father helps me. – Today or tomorrow, –Gulnisa ​​said confidently. Two days laterGulnisa went to the fieldagain. Reaching the place, she slowed down. Once, she stopped. The grass is mowed down, the hay is collected in stacks, and the strawberries are nowhere to be found. Gulnisa ​​kept going forward. “Where is berry place? I need to find it now! Maybe my father is already waiting at home!” That day she wandered a lot. The girl was hungry, thirsty, but, nevertheless, she picket a full basket of berries. She even collected bouquets. – Mom, I’ve found berries!Let’s dry it. Oh, would father come back before the berries dry!– dreamed the little girl. There were months, notdays. But Samerhanagay did not return to his native land. The city of N. turned into ruins. The fascists droppeda bombto the hospital. «Missing» – suchhorrifying news came to the family. And his family had waited. Every year in the middle of summer Gulnisapicked berries. Mother and daughter dried berries. They hadn’t eaten it before new harvest riped. It’s been years,Gulnisa ​​grew up and got married. But she also picked berries for her father every year. She did not tell her mother about this, did not want to hurt her soul. Fifty years have passed. Ones Yamilaapay, an old lady, told daughter her dream. – Today with your father we went to our field. It was full of berry flowers. In the place we stepped the berries immediately ripened. «So I managed to get back in time, my dear! Did I keep you waiting for me?» he said, and I woke up. – Mummy, in fact, berries are ripening. This year there will be good harvest, — said Gulnisa. – Well, that’s it! Your father will be glad when he returns! — exclaimed joyfully smiling Yamylaapay. –We’ll pickit together, won’t we, sweety? For a waiting person, half a century does not last long. For a loving soul time does not exist. 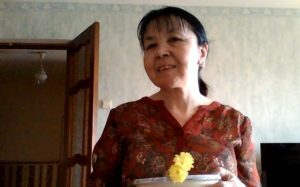 Gulnisa ​​silentlyembracedher eighty-yearoldmother.